1892 Henry Clay Camera Advertisement. "To open the Camera, press on the knob, visible on the front. This will allow the front to slide, and then swing under the bottom of the camera." Interestingly, 1891 was the only year in which ad text matched camera illustrations. From 1892 on, things get quite confusing because Scovill & Adams tended to use older engravings in later ads -- which may have been done to control advertising expenses. 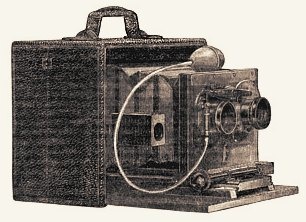 The 1892 American Annual of Photography ad (shown at left) illustrates a sliding-bed model with reversible finder mounted on the side of the body. Yet the text notes "The finder of the camera is now placed on the top of the front board ..." Further adding to the confusion are two references appearing in the 1893 issue. 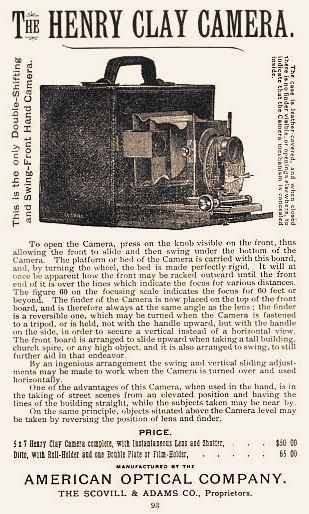 A user review entitled "A Splendid All Round Camera" describes and illustrates a Henry Clay Camera with bed struts while an advertisement in the same issue depicts a model from 1892 ads. The most confusing scenario would be that both models overlapped in sales dates. Confused? Wait, 1894 adds new twists. An 1894 advertisement appearing on page 84 of the American Annual Of Photography illustrates the strut bed model with text describing the sliding bed. 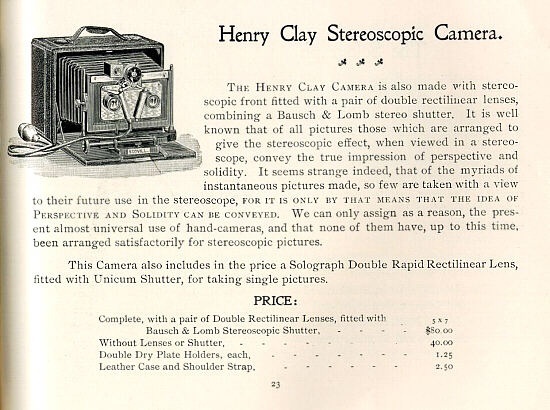 On the following page (85), the Henry Clay Stereoscopic Camera is advertised with body mounted reversible finder and sliding bed. Fortunately, ad text accurately describes the illustrated Henry Clay camera in subsequent years. This 1892 Henry Clay Stereoscopic illustration shows the body mounted reversible finder and sliding bed features.